Vailulu'u seamount is an active Submarine Volcano which is proposed to be formed at the current location of the Samoan Hotspot. In the overview map below its proposed location is shown with respect to Ta'u island. 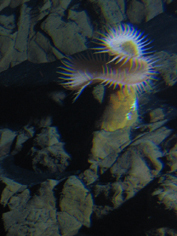 This seamount was for the first time surveyed in March 1999 during the AVON Leg 2&3 cruises, and more recently during the DeepFreeze 2000 and 2001 cruises onboard the icebreakers Polar Star and Polar Sea of the U.S. National Coastguard. Vailulu'u Undersea Volcano: the New Samoa. 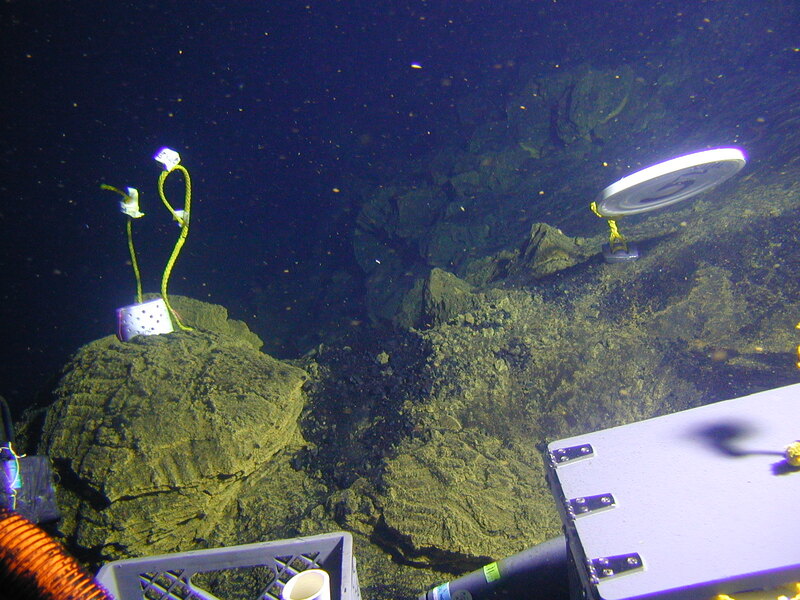 Hydrothermal Venting at Vailulu’u Seamount: The Smoking End of the Samoan Chain. Coast Guard helps scientists monitor volcano. As an example for the type of maps included in the Seamount Catalog we show here some bathymetric maps and 3D renderings for the recently studied Vailulu'u seamount. 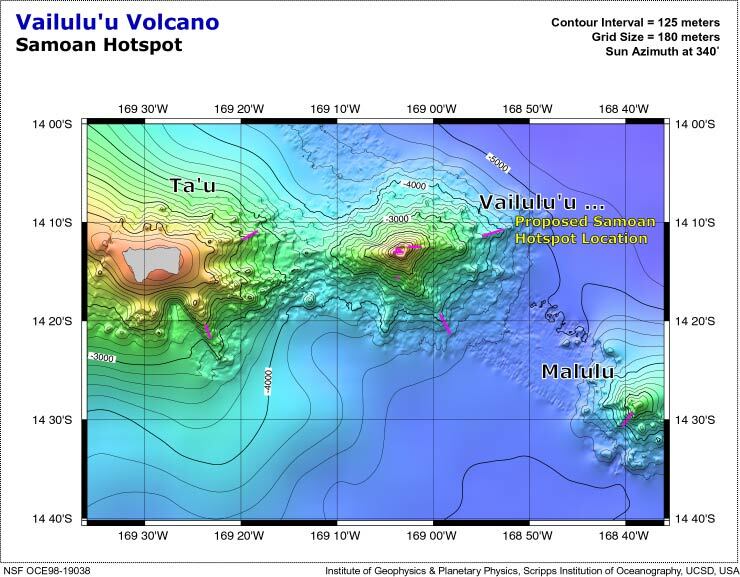 This active submarine volcano is proposed to be formed at the current location of the Samoan hotspot. In the overview map below its proposed location is shown with respect to Ta'u island. This seamount was surveyed in March 1999 during the AVON Leg 2&3 cruises. Two U.S. National Coastguard cruises followed in March 2000 and 2001 onboard the icebreaker Polar Star and Polar Sea. The maps shown above and through the buttons below are all produced from the SeaBeam 2000 survey performed during AVON Leg 2&3 onboard the R/V Melville. With a minimum rate of eight inches per day, a new volcanic cone has been growing inside the crater of Vailulu'u seamount since the last depth soundings by the US Coastguard vessel Polar Sea in April 2001. 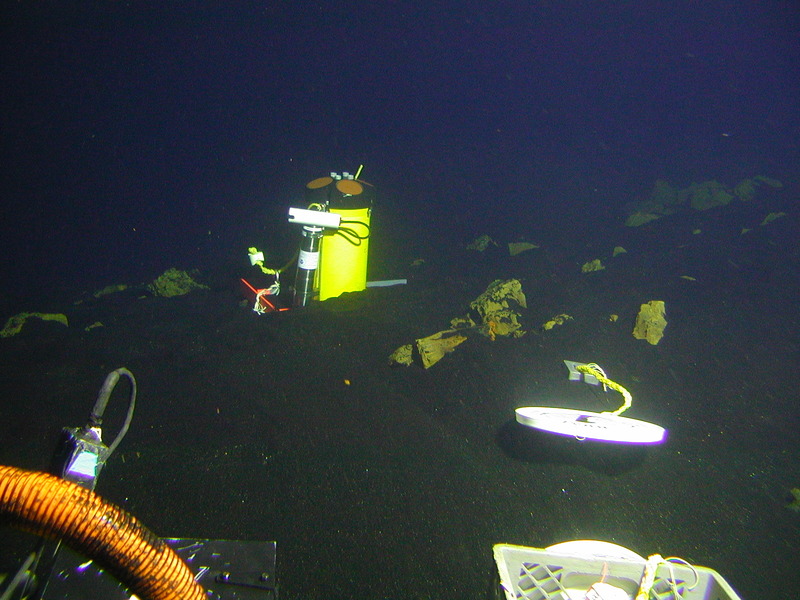 Our survey using the SIMRAD 120 system of the Kilo Moana show a radially symmetric volcanic cone in the eastern portion of the crater that displays a new volcanic summit at 708 m depth. This summit formed in a location of the crater that showed 1000m depth before the new volcano formed. This volcano was named Nafanua, after the Samoan Goddess of War. Nafanua was discovered during a recent diving expedition with the NOAA research submersible Pisces V (see pictures and video below) launched from the University of Hawaii Research vessel Kaimikai O Kanaloa (KOK). 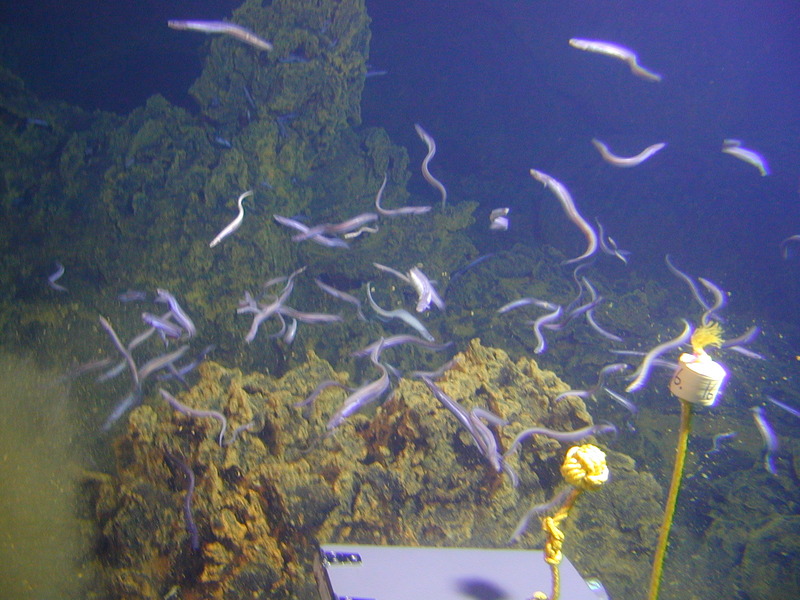 Nafanuas’ active hydrothermal system was apparent from the murky water that limited visibility during two submersible dives, several centimeter thick microbial biomats covering pillow lavas, and a large number of diffuse vents. The ALIA expedition mapped Nafanua and recovered a rock dredge with substantial amounts of pristine olivine-phyric volcanic rocks. Abundant large vesicles in the rocks from Nafanua suggest a volatile-rich magma that is quite capable of submarine lava fountaining and explosive outgassing in shallower water. Growth rates of Nafanua are sufficiently high to easily fill up the crater of Vailulu’u and bring its summit from its current 600m depth to about 200m within a decade or so. Eruptions of such a shallow volcano could offer substantial hazards to navigation and coastal communities, and involve the risk of tsunamis from potential volcano collapses. While we consider this scenario as very unlikely, it is prudent to keep an eye on this very active volcano.